I recently reviewed Duncan, BC’s Blue Grouse Estate Winery, and mentioned in the article that I was going to cover their sparkling wine in a separate article. The time is now! Their sparkling wine is called “Paula“, after their only daughter, Paula, who is an aspiring opera student. The wine is a blend of Pinot Gris 38%, Ortega 37%, Müller-Thurgau 10%, and Pinot Blanc 5%. Only 195 cases are produced. The majority of grapes come from their vineyard, with the Pinot Blanc coming from Oliver. The wine is made in the Methode Champenoise style, which means the second fermentation for the wine occurs in the bottle, just like Champagne. No Chardonnay, Pinot Noir, or Pinot Meunier grapes (the grapes of Champagne) in sight!. The grapes used are all aromatic, with two of the grapes having a Riesling heritage. Muller-Thurgau is a cross between Riesling and Madeleine Royale. Ortega is a cross between Muller-Thurgau and Siegerrebe. How interesting! Rating: Quite an interesting, complex sparkling wine. Lots of interesting aromas and flavours to enjoy with a plate of sliced fruits and cheese. Our other sparkler comes from the Limoux region of France; the southwest corner, just south of Carcassone. I originally bought this bottle at the Vancouver International Wine Festival in 2014. This particular wine, Sieur d’Arques Toques et Clochers Cremant, is made primarily with Chardonnay grapes, and other unknown varieties. It is not available in BC government liquor stores, but may be at private wine shops. It is listed across the border at Bevmo. This wine is a “Cremant” which means it is a sparkling wine, similar to “Champagne” without using its name. Cremant is French for creaming, or moderately sparkling. Cremants are made in different regions across France, tend to sell at a lower price than Champagne, and are generally quite tasty. 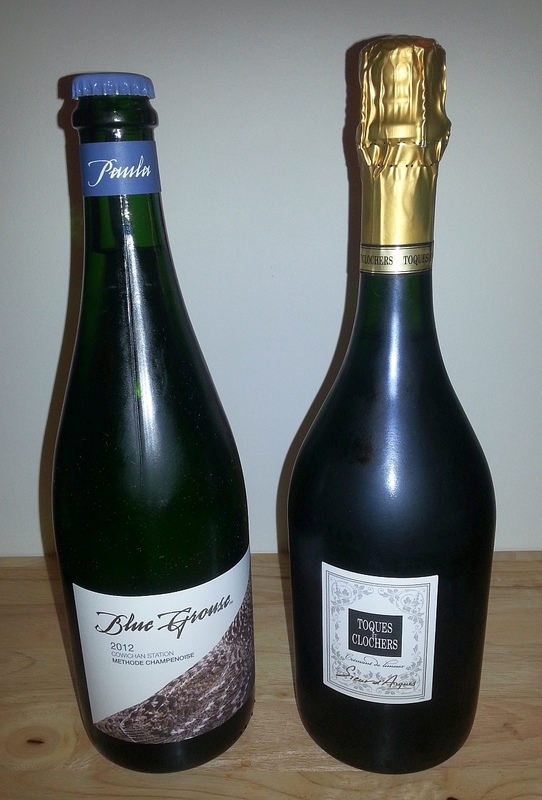 Sieur d’Arques Toques et Clochers Cremant, Limoux, France – Light pear colour in th eglass. Light pear and lees aromas. Dry, medium bodied, round, with higher acidity. Medium sized bubbles that are followed by pepperiness on the tongue. The bubbles finish quite quickly. Primarily apple flavour on the palate. Medium length with some bitterness. Rating: A straight forward sparkler that would be best enjoyed with food. Try a salad mixed with fresh seafood, or an omlette.